MPs are preparing to vote for their preferred Brexit option, with the PM due to meet Tory backbenchers in an effort to win them over to her deal. 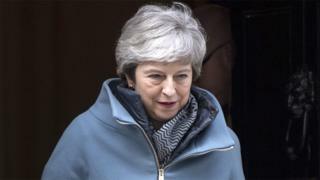 Some have suggested Theresa May must name the date she will step down to have any hope of winning MPs’ approval for her deal at the third attempt. But leading Brexiteer Jacob Rees-Mogg has hinted he may soon back the plan. Having voted to seize control of Commons business, backbench MPs will vote on Brexit alternatives later. The Speaker will select around half a dozen options, likely to range from cancelling Brexit to leaving the EU without a deal, with MPs marking on paper each option with a “yes” or “no”. The process is likely to continue into next week. However, it is unclear whether MPs will be free to vote as they wish or will take orders from party leaders. Former Health Minister Steve Brine, who resigned on Monday to back the move to force indicative votes, told BBC Newsnight more than a dozen others might quit government roles if they are denied a free vote. Meanwhile, the Scottish Parliament is expected to formally back calls for Brexit to be cancelled in a vote later. What is the PM’s next move? Mrs May continues to try to win MPs round to her deal, which has been heavily rejected twice. She is expected to address the backbench 1922 Committee ahead of Wednesday’s debate. The PM has signalled she will try to bring her deal back to the Commons for a further vote later this week but only if she believes she can win. Northern Ireland’s Democratic Unionists, whose 10 MPs prop up Mrs May’s minority government, urged Tory MPs to “stand firm” in their opposition unless there were “significant changes”. Writing in the Daily Mail, Mr Rees-Mogg – who is chairman of the pro-Brexit European Research Group of Tory MPs – said he was ready to back the deal so long as it won DUP support. But ex-Foreign Secretary Boris Johnson told the BBC there was “no point” supporting Mrs May’s deal “without any sign the UK is going to change its approach in phase two” of the negotiations. Otherwise he feared the country would be indefinitely tied to the EU’s rules. BBC political editor Laura Kuenssberg said the not-so-subtle subtext of Mr Johnson’s remarks was “if the PM promises to go soon, then she might get my vote”. What options might MPs vote on? Groups have been putting forward different options for the UK’s future relationship with the EU. Several are based on the assumption Mrs May’s withdrawal agreement with the EU will be approved, albeit with changes to the controversial Northern Ireland backstop. Customs union: This calls for the UK to negotiate a new customs union with the EU immediately after it leaves. Common Market 2.0: The UK would remain in the single market by rejoining the European Free Trade Association (EFTA) and staying in the European Economic Area (EEA). A “comprehensive customs partnership” would replace the Irish border backstop plan. It would accept continued freedom of movement but with conditions. EFTA and EEA: The UK would rejoin EFTA and sign up to existing EEA rules and obligations but make them enforceable through the UK courts. Rejects any customs union with the EU, instead seeking agreement on new arrangements for Northern Ireland. Malthouse compromise plan A: Mrs May’s withdrawal deal but without the backstop, which would be replaced by alternative arrangements. Another referendum: The public would vote on any Brexit deal which is passed by Parliament before it is ratified. Revoke Article 50: If the government has not passed its withdrawal deal, MPs would vote on a no-deal Brexit two days before the UK’s leaving date. If MPs reject no deal, the prime minister would have to cancel Brexit altogether. When will the voting take place? According to a copy of a business motion released by Labour’s Hilary Benn, there will be about five hours of debate on different options. Voting by paper ballot will take place at about 19:00 GMT, with the results announced by Mr Bercow later that evening. The process is likely to continue on Monday as MPs seek to whittle down options which could command majority support in Parliament. The government has until 12 April to propose a different way forward to the EU if it cannot get the current agreement through Parliament. Wednesday: This is when indicative votes will be held – we don’t know yet whether MPs will be free to vote how they want or be directed along party lines. The prime minister is also due to address the 1922 Committee of Conservative backbenchers. MPs will also vote on changing the Brexit date in UK law from 29 March. Thursday: A possible opportunity for meaningful vote three. The prime minister may hope that Brexiteers will finally decide to throw their weight behind her deal. Friday: This is written into law as the day the UK leaves the EU, although the PM has said she will pass legislation this week to remove it. The earliest Brexit is likely to happen is now 12 April. Watch Masters final round: Can Woods catch Molinari?